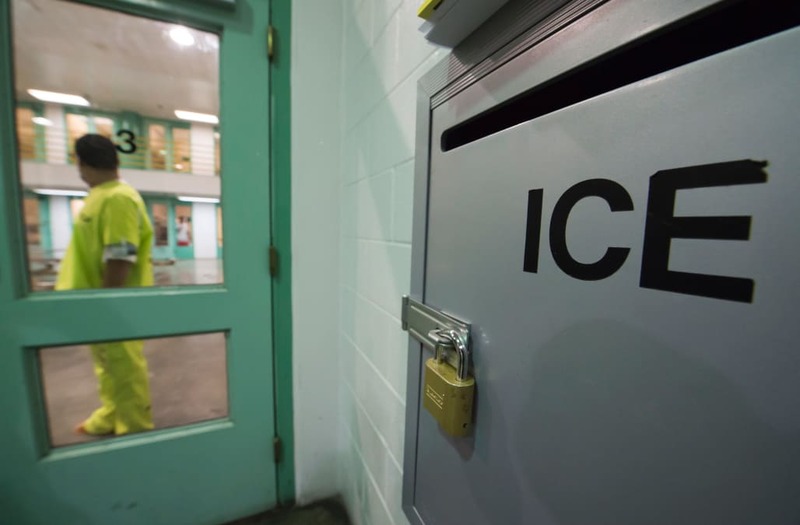 Two former prisoners at a California private immigration prison have filed a class-action lawsuit against the operator of the facility, claiming they were forced under the threat of additional punishment to do work around the prison for as little as $1 a day. According to the lawsuit, which was filed on May 31, plaintiffs Sylvester Owino and Jonathan Gomez accused CoreCivic, one of the largest private prison companies in the country, of forcing them to do things like clean bathrooms and medical facilities and run the prison law library. They also claim that they were forced to perform clerical work for CoreCivic, which owns and operates the Otay Mesa Detention Center in San Diego, where the two men were held. "In some instances, CoreCivic pays detainees $1 per day, and in other instances, detainees are not compensated with wages at all, for their labor and services," according to the lawsuit. It added that "CoreCivic reported $1.79 billion in total revenues" in 2016. CoreCivic is the new name for Corrections Corporation of America, which has come under fire in recent years on a number of issues, including the treatment of its inmates and the company's alleged lobbying efforts to sway state and federal lawmakers in the awarding of contracts. In 2015, 51 percent of CoreCivic's — then CCA's — revenue came from federal contracts. CoreCivic, a publicly owned company with stockholders and competitors, did not immediately respond to Vocativ's request for comment. "What you have is a civil immigration detention system, being managed by for-profit companies, based on a criminal detention model with detainees being coerced and forced to work under threat of punishment, or in some instances for as little as $1 per day," Robert Teel, the attorney who filed to lawsuit on behalf of the plaintiffs, told Vocativ. "You can imagine what an unfair competitive advantage it is for a company to pay its employees $1 per day instead of minimum wage." Inmates earning pennies for working in a prison during their sentence happens at just about every detention facility in the country. In many cases, it's how inmates fend off boredom and fill their commissary accounts. What makes an immigration facility different is that it isn't designated for people who have been convicted of a crime. The facilities are typically filled with undocumented immigrants awaiting deportation, or as their cases work their way through immigration courts. What also allegedly makes this case different is the plaintiffs' claim that if they didn't work, then they were subject to additional punishments, such as solitary confinement or a loss of other privileges. "The immigration detention and removal system is, by law, a civil system," Teel said. "Those in immigration detention include asylum seekers, green card holders, and those awaiting immigration hearings. The persons within this system are not awaiting criminal trials or serving criminal sentences, and the system is not intended to serve a punitive purpose." The lawsuit against CoreCivic also alleges human trafficking. "The total number of civil immigration detainees who were subjected to defendant's forced labor and human trafficking practices, and defendant's illegal dollar-a-day work practices is currently unknown, but these illegal practices appear endemic to the CoreCivic operations on a California-wide, and indeed a nationwide, scale," the complaint states. "However, CoreCivic can provide the information regarding how many civil immigration detainees were subjected to these illegal practices through its solitary confinement and detention logs and also through its business records." Owino is a Kenyan immigrant who came to the U.S. in 1998 on a legal student visa, according to a 2015 profile published by ThinkProgress after he was released from custody following nearly 10 years in immigrant detention facilities. In 2003, he was arrested for robbery and served 26 months in a California state prison. In 2005, he was transferred to the custody of Immigration and Customs Enforcement where he spent the next decade going through deportation proceedings, according to the complaint. While in ICE custody at a CoreCivic facility, Owino, who was released in March 2015, claims he "provide[d] labor and services in an unsafe working environment cleaning and maintaining CoreCivic's on-site medical facility without personal protective equipment." In 2016, the Obama administration announced its plan to end contracts with private, for-profit prisons like those operated by CoreCivic. Justice Department officials found that "the facilities are both less safe and less effective at providing correctional services" than prisons run by the Federal Bureau of Prisons. Following the election of President Donald Trump, and after months of rhetoric about rounding up illegal immigrants, it was announced that the federal government would increase its "civil immigrant detention capacity" by more than 450 percent. It's a move that, according to the complaint, is "in essence a 'get into jail and work for free card' from which [CoreCivic] derives nearly $1 billion a year in revenue." The post Private Immigration Prison Hit With Lawsuit Over Forced Labor appeared first on Vocativ.